It’s a rainy Monday evening in Atlanta. 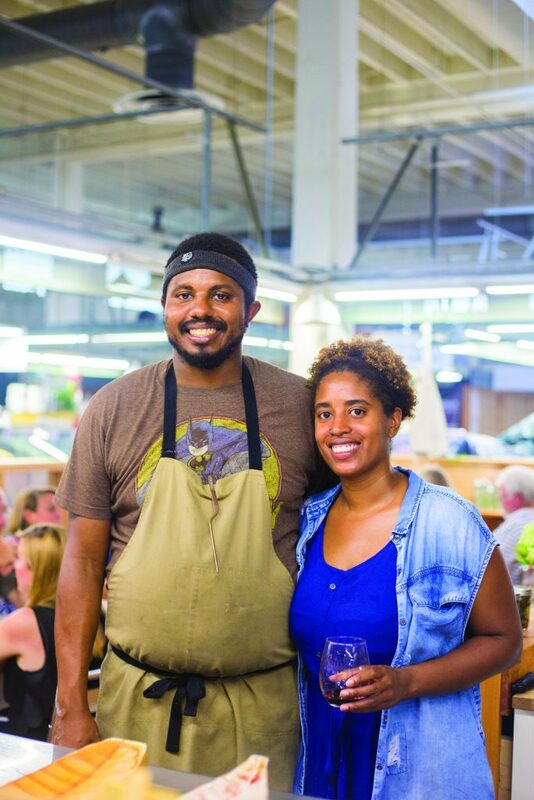 Inside the century-old Sweet Auburn Curb Market, Mike and Shyretha Sheats put finishing touches on sixteen plates of clams before send them to the dining room. Tonight, the dining room is a single communal table located approximately two yards from the tiny kitchen where Mike works. He has less elbow room here at the Learning Kitchen space inside the market than at Staplehouse, where he is a line cook. Shyretha deftly tops off diners’ glasses with Athens-brewed cucumber gose beer from Creature Comforts. Luna, their wide-eyed, four-month-old baby is strapped to her hip. Mike emerges from his crowded prep space to shyly tell the group about the clams, smoked lettuce, and juiced asparagus on their plates. Diners, seated shoulder-to-shoulder, crane to hear him over the metallic racket of the Curb Market’s ancient air conditioner. 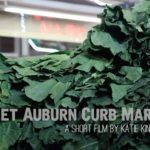 Katie King explores the history of Sweet Auburn Curb Market in this SFA film. Ma Ruby’s gatherings were plate sales: casual and slightly chaotic, bringing people together over Styrofoam plates of food. 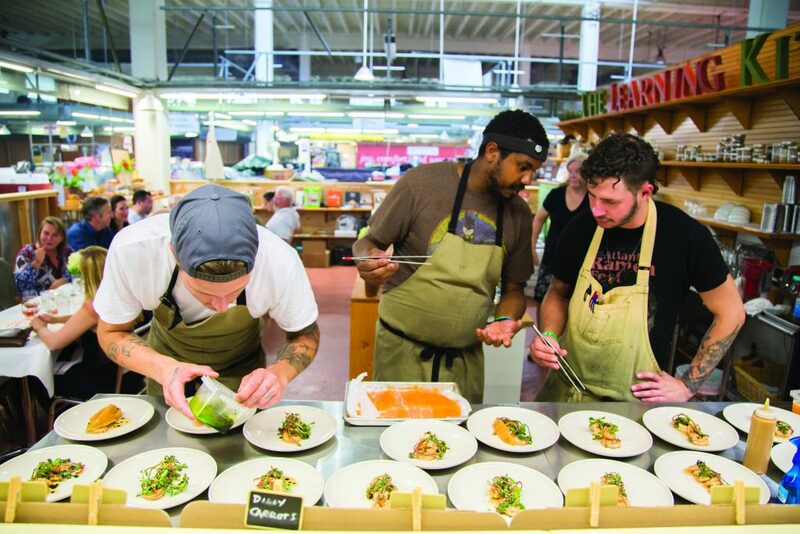 The scene at the Curb Market was the Plate Sale: Mike and Shyretha’s roving Athens- and Atlanta-based pop-up dinner series takes inspiration, in name and aim, from those loose-knit socials in church parking lots and backyards. The couple first developed the idea for the series while living in Charleston, where Mike staged at McCrady’s and Shyretha tended bar at the Gin Joint. 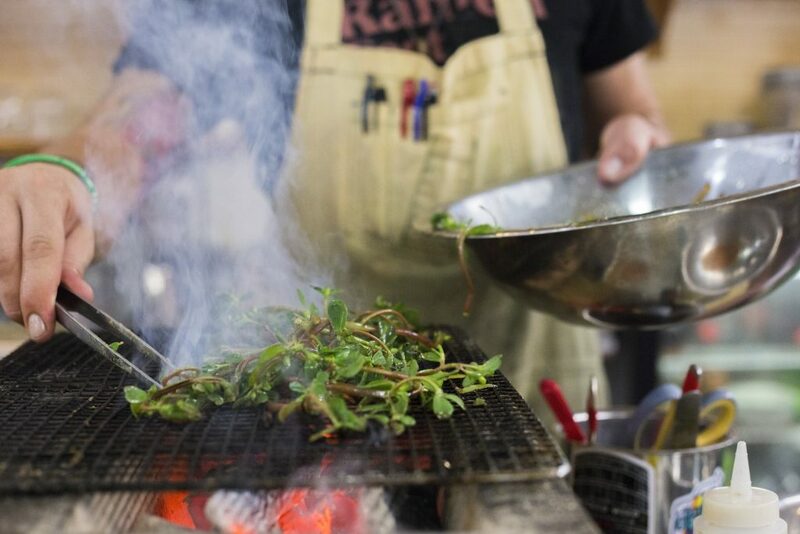 They were ready to put down roots in Atlanta after a string of moves: from Athens to Atlanta while Mike attended Le Cordon Bleu in suburban Tucker; to Smyrna, where Mike worked in the kitchen at Muss & Turner’s and first met Staplehouse cofounder Ryan Hidinger; and on to Charleston in 2012. No matter where they lived, they entertained and fed people in their home. The series seemed like a natural progression. The Sheatses’ dinners are different from the fish and fixins that Ma Ruby served. A second course may feature cured egg yolk grated over turnips and a single fried onion ring, paired with a white Bordeaux blend handpicked by Shyretha in her living-room R&D sessions. But the ethos is very much the same. 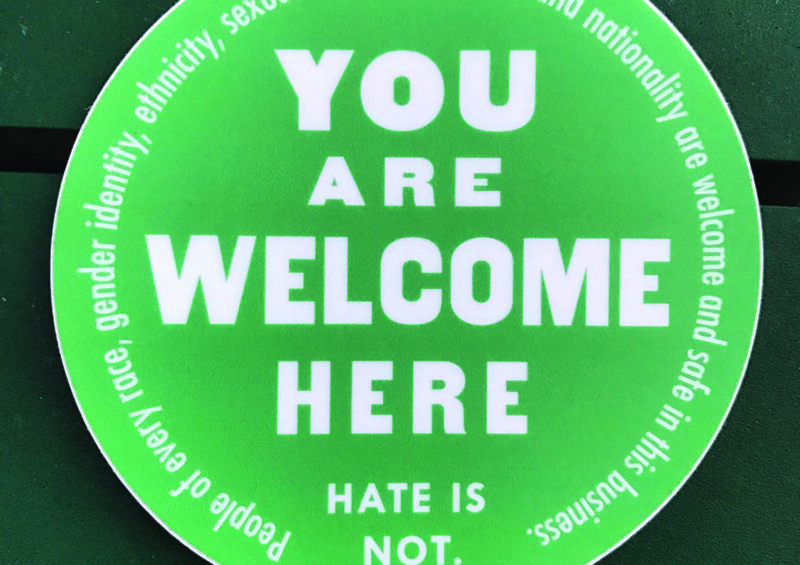 “It’s more about engaging people, meeting new people, and being hospitable,” Mike says. 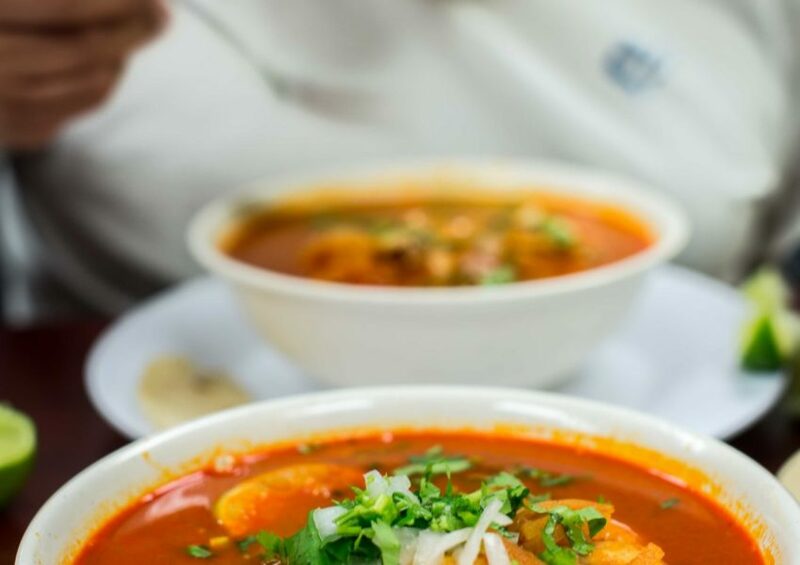 They see a need for people coming together now more than ever, even over something as simple as dinner. 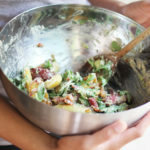 Enjoy Erika Council’s recipe for an unconventional potato salad. Farmers are part of that collaborative vision, too. Mike drives around the state, volunteering at farms for a day or so, to get familiar with area growers and seek out those who aren’t billed on farm-to-table menus. “One of our goals is to find others that deserve this sort of attention, or that maybe need it,” Shyretha says. She grew up next door to her grandmother’s farmstead and feels at home around manual labor. She trimmed branches and weeded at a handful of Georgia farms through Crop Mob, a volunteer organization, and helped to sow and harvest crops at McClellanville’s Thornhill Farm as an apprentice. Both she and Mike want to continue that tradition: They now work to develop Shyretha’s grandmother’s land, overgrown but rife with plums and wild shiso. 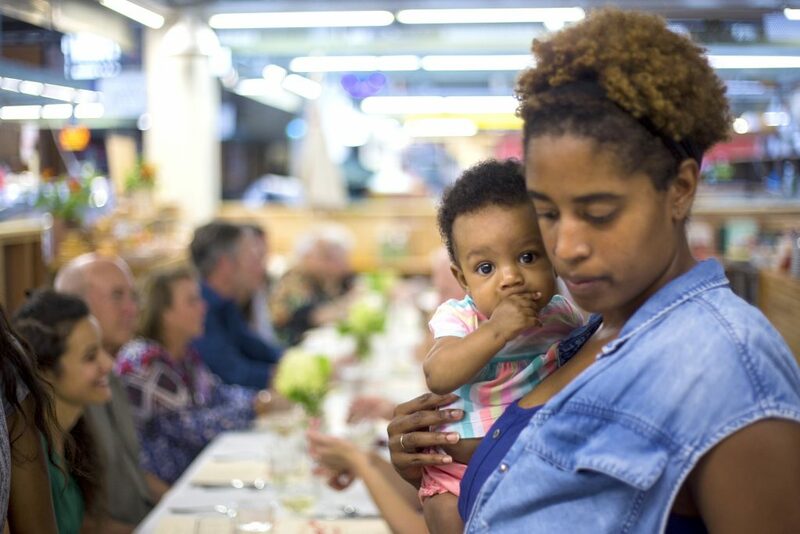 Along with nascent plans for a community market and coffee shop in southwest Atlanta (and, eventually, a restaurant to call their own), they keep their to-do list full. 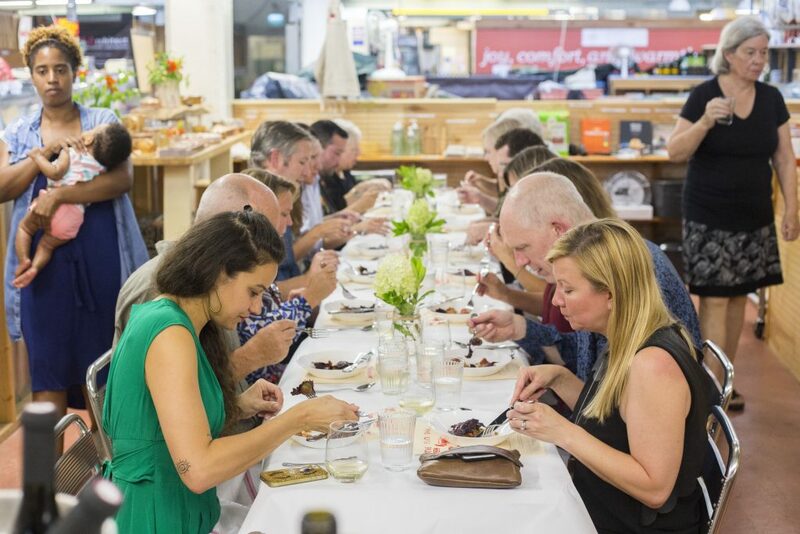 That night of the Plate Sale pop-up inside the Curb Market, guests arrived in neat pairs. Bubbles and four courses concluded in a whimsical popcorn-studded dessert. Diners laughed and traded Instagram handles while polishing off the Rhone Valley muscat. Mike and Shyretha, exhausted after a near all-nighter of prep work, looked on. “The sixteen people who showed up, I felt that they were supposed to be in the house,” Mike says. The table of strangers transformed into something convivial, fraternal, communal. Over the chatter, you could hardly hear the sputter of the air conditioner. Gray Chapman’s writing has appeared in Atlanta magazine, Communication Arts, Architectural Record, and BUST.